The gradient is stunning and the stamping pattern is just right on it! Bellissimo gradient e scelta dello stamping perfetta!!! That gradient is simply stunning!! Love your mani! I love the combo. And I don't think the design you chose hides the gradient at all. Looks great! Il gradient mi piace un sacco, e anche l'abbinamento con lo stamping nero (non mi pare troppo ingombrante)! Ti dirò che mi disturba più il motivo "spezzato" (se tu non avessi precisato l'avrei preso per un pezzo mancante)...Ma è una mia fissa!!!! Ha disturbato anche me, è per quello che l'ho sottolineato! Appena stampato ho pensato: "Ohhh com'è venuto bene!!"... poi vedo sti buchi e ci rimango malissimo -.- Allora ho riguardato il pattern e ho notato. That gradient is so stunning! I should have learned the lessons after years of stamping I guess! But nope! Beautifully done gradient! And I love the stamping over it! The gradient you used as your base is GORGEOUS! I always love stamping on top of gradients :). Thank you Deborah! Yes, I love stamping or glitters over gradients! Ahaha Lothwen! But the maze idea actually fits the broken circles! Love everything about this mani, its so beautiful. The swirls are so crisp and clean, love it. That gradient is AMAZING! And I love the stamping over it too! I love this, I think the design is just perfect! This is lovely! I like the two scattered holos together! 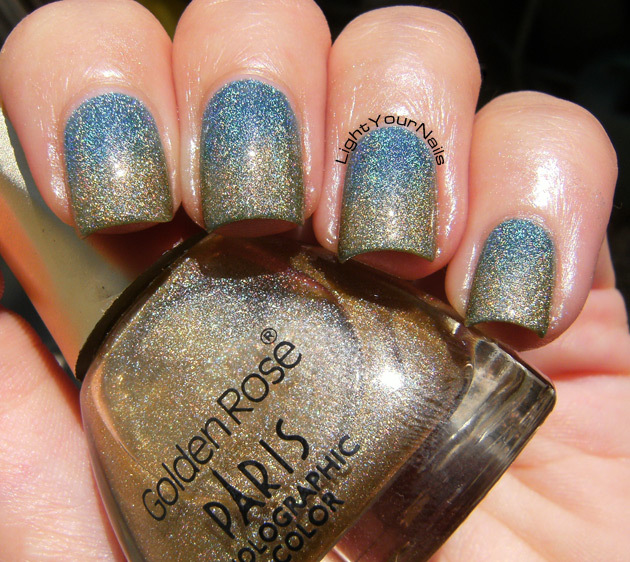 Le gradient holo sono il top! Lo stamping ci sta proprio bene, devo dire! !